Our certified process-driven approach helps healthcare providers to take advantage of continually improved processes, respond to developments in the industry, minimize errors, improve the bottom line and provide a higher level of patient care. 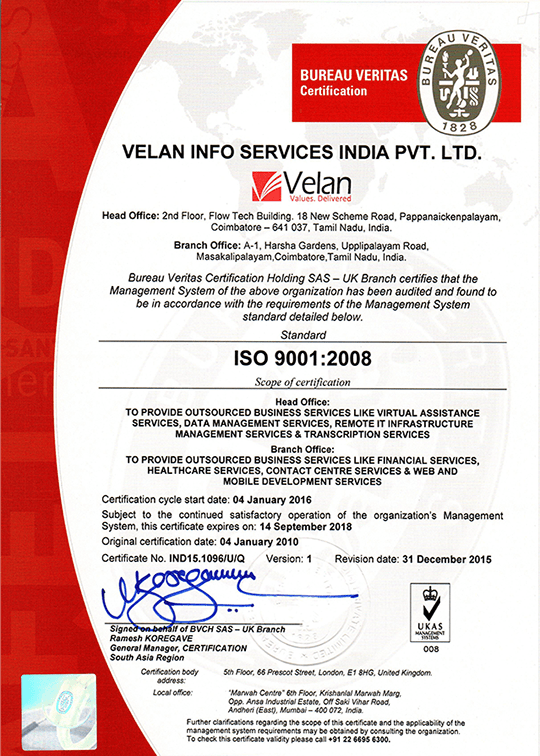 Velan addresses the paramount concern of patient health information security by practicing international standard security controls. Claims are processed and submitted within two business days. Delight follow-up with insurance companies ensures quicker revenue for practices. Providers have more time to give quality care to their patients and build practices. Engagaing Velan's reliable healthcare services free up providers staff and allow them to focus on value added services to patients. It has been very helpful having you as our team member in India. I appreciate everything that you do for the office. Truthfully, anything you contribute behind-the-scenes allows us to have more time to interact with the patients every day.